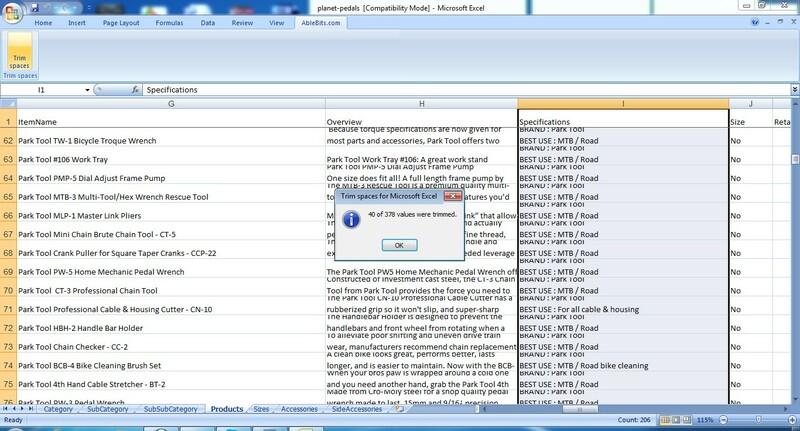 Tired of manually removing leading and trailing spaces in MS Excel cells? Here's my tips that works instantly even without using any formula. There's a free tool called Excel Space Trimmer made by AbleBits handy for removing invisible extra spaces in your entire worksheet that you're not aware of. 1. In your Microsoft Excel worksheet, select the cells, columns or rows from which you want to remove excess spaces. 2.Start the Trim Spaces by clicking on its icon, or go to the Excel Ribbon Ablebits.com -> Trim Spaces for Excel. 3.Click the "Run" button and enjoy the results!